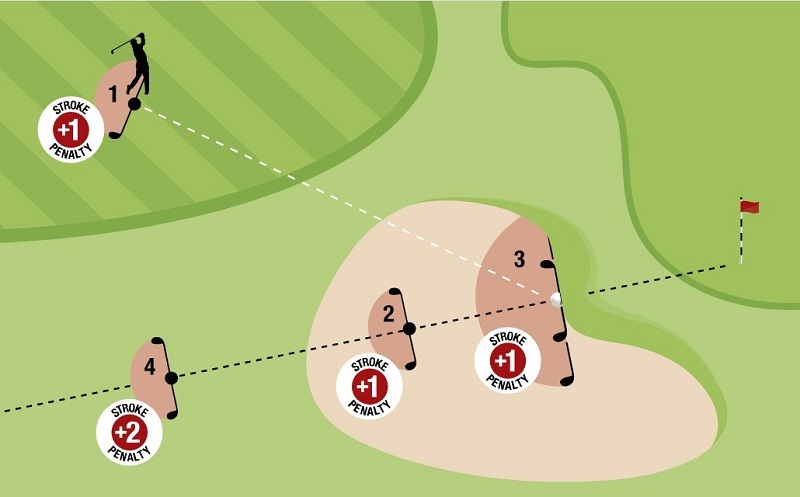 Stroke and Distance Relief: For one penalty stroke, the player may play the original ball or another ball from where their previous stroke was made. Back-on-the-Line Relief: For one penalty stroke, the player may drop the original ball or another ball in a relief area that is based on a reference line going straight back from the hole through the spot of the original ball. But very important to note that with this option for one penalty stroke, the relief area MUST be in the bunker. Lateral Relief: For one penalty stroke, the player may drop the original ball or another ball in a relief area that consists of two club lengths to the right of where the original ball lay (no nearer the hole), two club lengths to the left (no nearer the hole), and two club lengths behind the ball. But as with option #2, it is very important to note that with this option for one penalty stroke, the relief area MUST be in the bunker. But now under the new Rules of Golf, the player has an additional 4th option that will allow them take unplayable ball relief outside of the bunker. As an extra relief option when a player’s ball is in a bunker, for a total of two penalty strokes, the player may take back on the line relief outside the bunker. For any players who would like a little more clarification on how to take back on the line relief, please refer to Rule 19.2b of the Rules of Golf. While options #1-3 may seem like the better options given that they only cost a player one penalty stroke, there are times when option #4 may actually save a player strokes. Finding yourself in a bunker with a buried lie and with little hope of advancing a ball. Or finding yourself in a deep bunker that you may not feel you can get out of in one or two shots are examples of when this additional unplayable relief option could be beneficial to you as a player. Please refer to the diagram below to get a better idea visually of how each of these options may be used.